During times of stress, with threats of war and terrorism, we often overlook the obvious when it is a part of our lives. Although we may not realize it, our youngsters share our fears and misgivings during times of uncertainty. chance to get away from it all. Why not go fishing? If you have never taken a kid fishing, you have missed a great adventure. If you ask the kids, they may surprise you with a great interest and a “lets go” response. If you do take a fishing trip with a kid or two, be prepared to see them out fish you and don’t be surprised to see them sit perfectly still waiting for the next bite. As for fishing being expensive ­ not so. For the price of some video games, you can buy a rod and reel and have enough left over for a little plastic tackle box. Throw in a few hooks, sinkers and bobbers, perhaps a Mister Twister or Rubber Frog (the kids love them) and you’ve got all you need to get started. Sound simple enough? It is ­ and if carefully selected, the equipment could last for years to come. If in the past you have not been interested or experienced in fishing, why not give it a try? Perhaps you and your kids will discover it to be both rewarding and relaxing. It may take your mind away from all the cares you and your youngsters have been burdened with. If you take your kids fishing, don’t begin with an all-day trip. If the fish don’t bite and the youngsters want to quit after awhile, don’t force them to keep trying. Suggest to them the fish may bite better the next trip. Try not to begin the fishing experience on a long charter way offshore. Give the kids a chance to get the feel of things first before expecting too much of them. A trip to a dock or breakwall, along a river or even just on a small pond, is a good place to start. A creek bank can provide a good opportunity to catch dinner or just catch and release fish. The fun and enjoyment is still there and the squeals, laughter and excitement of watching a kid catch a fish can even make you feel younger. There is one common drawback to fishing with kids; the adult often has to have a slice of humble pie. 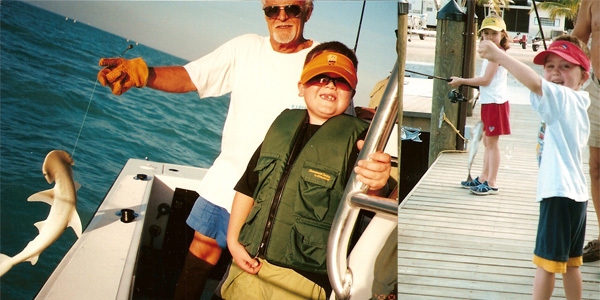 My experience has been youngsters frequently catch the most and biggest fish. As the father of four girls that all loved fishing, I have many fond recollections. I recall when daughter number one caught a large pike fishing in Bird Creek in Port Austin and wanted to “save” it in the laundry tub. Another time I took two of the girls fishing in our small boat. I had a tough time teaching them how to bait their hooks, or maybe they just didn’t want to learn. On a good day they always out fished me because I was too busy rigging and baiting hooks to have a chance. I’ve fished with my grand kids­ boys and girls, on little docks where we caught grasshoppers for bait and threw the line out on a lake no bigger than a large puddle. I’ve fished with all of them on my charter boat on the Great Lakes and some have joined me for fishing on ocean waters. Each trip has provided great memories. Another observation I can pass along from my 24 years of charter experience is the fact fishing is not just a father and son activity. I take fathers and daughters, mothers and sons, uncles with nephews and nieces and whole families. Once the kids get “hooked,” I see them again and again as they grow up and than I see them “again” with their kids. One thing I never hear on my charterboat is the beeping of a game boy or a plea to go home to the T.V. or computer. If you take a kid fishing, you may discover fishing and chatting with your children could form a whole new bond and memories that are everlasting.